Date A Cowboy is the premiere dating website for people who enjoy a country style of living and it shows on every corner. From the very first moment on this website, you will understand quite clearly that the members all have a very special country type of upbringing and that they all live a certain lifestyle that brings them closer together. Almost every face you see on Date A Cowboy will be framed by a hat and don’t be surprised to see a lot of denim. It feels breezy and unassuming and that is exactly what you want from a cowboy dating website. Date A Cowboy has been around since 2004, meaning that it has been serving the country community for more than 10 years. With a website that has been around for that long, you need to understand that its age might have an effect on the design of the website. And truly, when compared to some newer websites, Date A Cowboy may seem a bit basic. However, when you dig deeper and start using the website, the clear lines and the simple design actually start to become an advantage, rather than a problem. 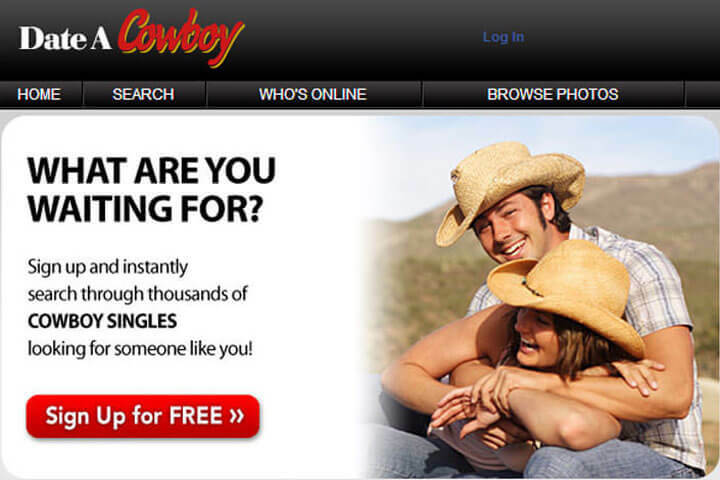 Namely, with a very clear design, simple color scheme and down-to-earth fonts and cells, Date A Cowboy is an extremely easy website to navigate and use, even if you happen to be of a certain age and you are not too versed with using dating websites. While we are on the subject of the design, as you might expect, the photos that are used to make the site more appealing all have a country feel to them, with country couples who are clearly having a ton of fun. 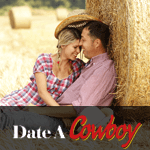 Once you start using Date A Cowboy, you will soon find out that it is one of those websites that are tailored to the users. Everything is exactly where you would expect it to be, the categories are very clear, the features are always right there where you want them and using the website is as easy as wrangling a young calf. Simply put, there is no way you will not find what you want on this site. The ultimate goal of Date A Cowboy is to bring people together and all of its features have been implemented to enable this easily and efficiently. Once you register, you will be creating your profile that you will then use to attract other country singles and to find singles who will be interesting to you. You can easily send messages to people you find attractive and you can send them ‘flirts’ letting them know that you are interested in them. There is also a matching feature that will allow you to more easily find the perfect date for you. In addition to this, there are plenty of chat rooms which are always active and where you can chat live and in forums. You will also be glad to hear that Date A Cowboy is absolutely mobile-friendly meaning that you can go on with your active lifestyle and still keep in touch with all your new friends and potential love interests. Date A Cowboy is quite possibly the biggest dating website of its kind and the best way to experience this is to simply look at all of the country singles in your area. Depending on your area, you will be finding hundreds and thousands of eligible singles who share your lifestyle. With the name Date A Cowboy, you might be worried that it is a website where only men have profiles and where the ladies come to pick. It is even often advertised as a place where ladies can find their perfect cowboy. Of course, this does not mean that you will not be able to find gorgeous cowgirls in case you are a man who wishes to start using the website. Also, if you are worried that you might be in trouble because you live in a large city, don’t be. There are plenty of members who share your love for the outdoors and who share the same values. Maybe they moved to the big city, just like you. Date A Cowboy is, without a shadow of doubt, the best cowboy dating website out there and that is mostly because of its gigantic membership base and the opportunities for meeting the perfect date. It is also easy to use, even easier to navigate and it will provide you with endless hours of great cowboy or cowgirl fun.